The Energy Information Administration released its Short-Term Energy Outlook for November, and it shows that OECD oil inventories likely bottomed in June at 2.807 billion barrels. It estimated a large 20 million barrel gain for October. Though it forecasts that stocks will drop in December to 2.867 billion, that is 50 million barrels higher than in the October outlook. 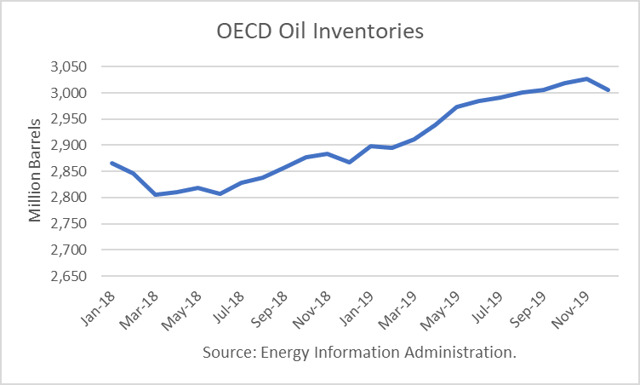 Throughout 2019, OECD inventories are generally expected to rise, reaching 3.0 billion barrels in August. It projects ending the year with 138 million barrels more than at the end of 2018 in glut territory. The moment of truth has come, and it appears that the sanctions will cut less of Iran’s production and exports than has been added by OPEC+ producers and the U.S. That is why oil prices have been dropping for eight straight sessions. 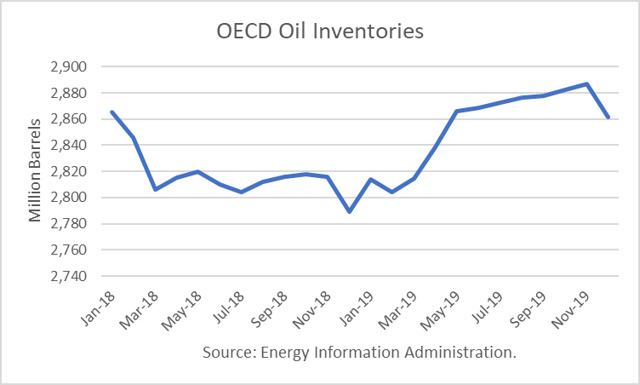 The Energy Information Administration (EIA) released its Short-Term Energy Outlook for October, and it shows that OECD oil inventories likely bottomed in July at 2.806 billion barrels. It shows inventories rising in the third quarter, contrary to the normal seasonal trend. However, it forecasts that stocks will drop in December to 2.817 billion after the Iranian sanctions are expected to go into effect. 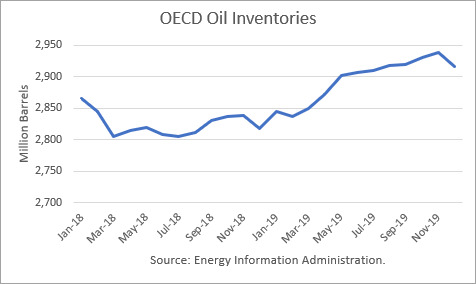 Throughout 2019, OECD inventories are generally expected to rise, ending the year with 98 million barrels more than at the end of 2018. The expected drop in Iranian production, due to the U.S. sanctions, is forecast to be more-than-offset by increases from other producers, such as the U.S., Canada and the Gulf states of Saudi Arabia, Kuwait and the UAE.